Targeting the Bharatiya Janata Party-Rashtriya Swayamsevak Sangh, the Trinamool Congress on Thursday alleged that 'pressure was mounted' on the organisers to cancel a programme in Chicago in the United States on the occasion of 125 years of the historic address by Swami Vivekananda, where West Bengal Chief Minister Mamata Banerjee was invited. 'Vivekananda Vedanta Society of Chicago, on the occasion of 125 years of the historic address by Swami Vivekananda, had invited Mamata Banerjee to attend a programme in Chicago. The chief minister of West Bengal confirmed her participation to them,' TMC's chief national spokesperson Derek O'Brien said in a statement. 'Subsequently, it is learnt, that under 'tremendous pressure', the organisers were prevailed upon to cancel the programme. It is common knowledge that the BJP-RSS wanted only one major programme to be held in Chicago and that would be under the banner of the Global Hindu Congress (World Hindu Foundation) and this programme would be attended by Mohan Bhagwat,' the statement added. O'Brien also termed the External Affairs Ministry's statement on the issue as 'low-on-fact argument'. Banerjee had on Tuesday said, "I wanted to go to Chicago.... I could not go there because of an unholy conspiracy hatched by certain people. This incident has given me a lot of pain." 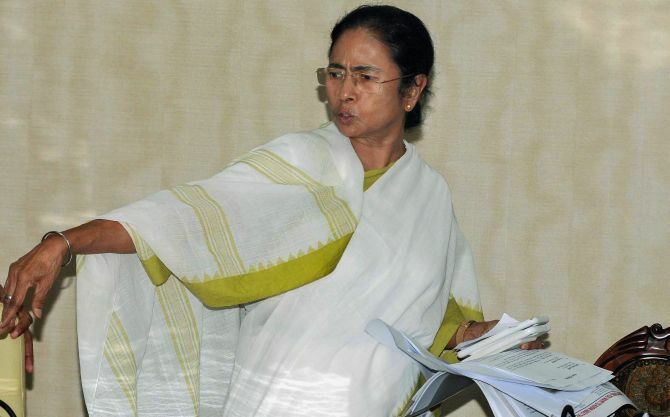 "We did not receive any request for clearance regarding the visit of Mamata Banerjee to Chicago for the event. The reports about the denial of permission are, therefore, not true," he said in response to a question.